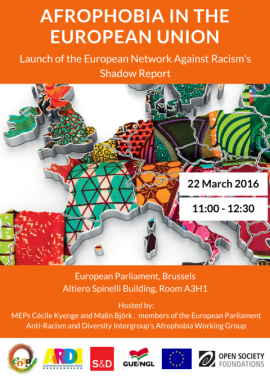 The European Network Against Racism is launching its Shadow Report on Afrophobia in Europe. The 2014/2015 edition looks specifically at the situation of people of African descent/Black Europeans in the European Union. Afrophobia refers to the specific form of racism that affect people of African descent and covers structural discrimination correlated to historically repressive structures of colonialism. The report is the first pan-European report specifically dedicated to mapping discrimination and inequalities faced by people of African descent in Europe/Black Europeans. These can take many different forms: dislike, personal antipathy, bias, bigotry, prejudice, oppression, racism, structural and institutional discrimination, racial and ethnic profiling, enslavement, xenophobia, societal marginalisation and exclusion, systematic violence, hate speech and hate crime. During this launch event we will present the findings from the Shadow Report and discuss how we can combat Afrophobia throughout the EU. It will gather Members of the European Parliament, EU officials, NGOs, representatives of the Fundamental Rights Agency, etc.